Tower defense games have covered a lot of creative ground over the last five years. They've gone from simple desktop amusements to a staple of the indie game scene, having been integreated into nearly every other type of game and released on every platform. They have taken place in ancient times, the far future, and on alien planets. But one place they (and most other types of video games) have never taken place is the real world. Not a virtual recreation of the world, but on the very terra firma supporting my desk chair as I type. But new developer Kineplay's upcoming debut game World Siege: Orc Defender does just that. A gameplay demo from Kineplay. It is not the first game to use the augmented reality (AR) technology on the iPhone and 3DS to use real world elements in video games, but it is by far the most ambitious and exciting. Players start the game by creating an avatar, in this case one of six different classes of orc, using Kineplay's self-lauded InterEntitiy customization engine. The goal is to acquire as much money, fame, and terriotory for your orc as possible. Instead of conquering the virtual lands of Azeroth or some other such place, however, players are conquering keeps and kingdoms located in the real world, owned by other players. Players can build their own castles wherever in the real world they like: around the house, in the office, or in a frenemy's bedroom. These must then be stocked with defenders who will combat other players attempting to take over your castle. 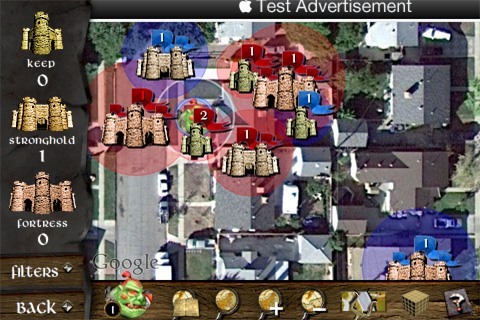 Tracking down other players to fight is easy, thanks to the mapping software on the iPhone, which can display nearby castles for you to attack (see image below). In-game money and influence are proportional to territory controlled, so dominating the landscape is the main goal. The game hasn't been released yet, so it is still unclear whether any of this will result in a fun game (the combat looks pretty rudimentary) or whether it will just be a glorified tech demo. It abundant, and turf wars could turn into epic long-term affairs. Kineplay states that the game is ready to come out whenever Apple approves it for the App Store, so iOS users: prepare to defend yourselves. News: "Frankie Goes to Hollywood" Says: Welcome to the Pleasuredome! Android Vs iphone faction battles! Yes. Unfortunately Kineplay has stated that an Android client is pretty far away at this point. There was an android game like this where it took place on a google map and used your GPS as your starting point, think it was called parallel kingdom or something, not as fancy as this one for sure. Intriguing. When I get my recently-dropped Evo fixed this weekend I'll check it out.